I enjoy tradition and appreciate history. But, I ADORE anything labeled "new" or "the next big thing." I can't help but just sort of gravitate with curiosity towards a trend. And, if it's not my thing? Oh well, at least I've had the adventure of checking into it. So, for months now, I've seen an increased number of ads and posters around town promoting little tiny bottles of beverages referred to as Beauty Shots. The bottles are marketed towards women and have all sorts of feminine colors and cute names: iBeauti-full, beauti shot, i-healti, blink (I'm going out on a limb here, but guessing that refers to "in the blink of an eye you'll be gorgeous."). And, they all seem to pack an extraordinary amount of cosmetic filler and vitamins into those bottles. So, with my husband out of town (he usually saves me the torture of shopping with the kids) I was left to do our weekly grocery shopping. And, of course, when I strolled by the impressively large segment of the grocery containing beauty beverages, I quickly snatched a couple of them for the cart. I'm not sure what I was thinking would happen when I swallowed, but I was sure to find a quiet moment to myself (in the event I would turn into some other creature and my children wouldn't recognize me?!). Sending out a quick prayer that there was nothing dangerous in the little metallic bottles, I quickly chugged down one laden with both collagen and beta carentene. Gulp. Swallow. Hey, not so bad. I cracked open the one labeled sugar-free glycosamene and collagen. Hmmm. Intensely carrot and tomato-like, the little shots weren't so bad. 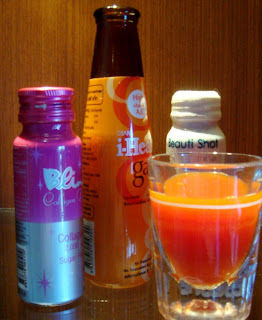 Next up, the pink bottle with three days worth of vitamin C and E servings. These were invented last week when my kids and I had scheduled a playdate and (horrors!) had no goodies in the house to offer to our guests. So, I pulled out the last egg, my dearly saved imported darkest chocolate bar and bags of unsweetened shredded coconut that I had in the pantry. Devoured hot out of the oven, these cookies were an instant hit! Cream butter and sugars together until well whipped. Add baking powder, soda and egg. Mix well. Add flour first, stir just until combined. Then, add the coconut. Stirring until well combined. Mix in chunks of chocolate. Form into small balls and gently push down onto a silicone or parchment lined baking sheet. Bake for 5-7 minutes, until lightly golden, in a 375 degree oven.